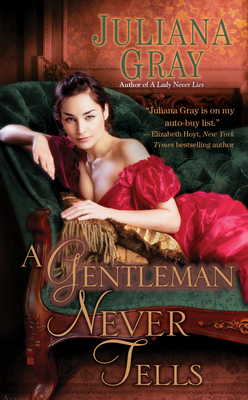 A Gentleman Never Tells is the second book in Juliana Gray’s Affairs by Moonlight trilogy, inspired by Shakespeare’s Love’s Labour’s Lost. As a Shakespeare fan, that was already one point in favor of the book and series right off the bat. The first, A Lady Never Lies was released in August, and the third, A Duke Never Yields, comes out February 2013. I have read A Lady Never Lies, and thoroughly enjoyed it, and so I jumped at the chance to read and review A Gentleman Never Tells. I don’t believe it’s necessary to read the first book to enjoy A Gentleman Never Tells because it definitely stands alone, but I think reading the books in order will allow certain plot points to make more sense. The timeline for all three books is the same, and events overlap. Therefore, scenes in A Lady Never Lies appear in A Gentleman Never Tells, but from Roland and Lilibet’s point of view. I admire what a logistical feat it must have been for Ms. Gray to keep the timelines and criss-crossing action consistent throughout the series, and it was interesting getting the same scenes from different perspectives, especially the peach orchard scene, which was so funny and a personal favorite of mine. The first thing that intrigued me about A Gentleman Never Tells and the entire series is the fact that it takes place in the Tuscan countryside and during the Edwardian era (Think Downton Abbey and/or Laura Lee Guhrke’s Abandoned at the Altar series). The setting and time period aren’t common in the romance genre, and I enjoyed reading about the cultural, technological, and social changes happening during the time and loved the beautiful depictions of the Italian countryside. Sir Roland Penhallow has spent the past six years as a covert intelligence agent for the Crown. When he and Lilibet first met, it was love at first sight, and he was instantly smitten. Roland was on the verge of proposing but his work prevented him from following through, and Lilibet was forced to wed another. But he has never forgotten Lilibet, though the callus way he left her leaves him with little hope that she would ever forgive him, estranged marriage or no. But fate (or is it?) gives him another chance when both of them end up at a remote Italian castle for a year with her cousins Alexandra (heroine of A Lady Never Lies) and Abigail and his brother the Duke of Wallingford, and famous inventor Phineas Burke (hero of A Lady Never Lies). Lilibet, Lady Somerton, is a woman on the run with her young son Phillip. She is determined to escape her horrible marriage by any means necessary, even if it means the unspeakable scandal of seeking a divorce. However, that means she must make every effort to maintain a pristine reputation because any hint of scandal would mean her divorce petition would not be allowed. This causes instant conflict, as Lilibet must resist Roland for the sake of herself and her son, despite all the sparks that are rekindling between them. The relationship between Roland and Lilibet was deep, complex, and very well depicted. Reunited lovers is a trope I enjoy, and Ms. Gray’s version is no exception. Roland must work to regain Lilibet’s trust after abandoning her and leaving without a word all those years ago, and reveal the truth about what happened six years ago. He immediately senses that Lilibet was in trouble, and his protective instincts are roused. Roland’s bonding with Lilibet’s son Phillip and the lengths he goes to keep Lilibet and Phillip safe endeared him to me right away. My one very minor quibble is the use of period phrases and lingo was very jarring to me and took me out of the book a bit at times. But that is very likely my own personal issue, and shouldn’t discourage other readers from giving the series a chance. I thoroughly enjoyed A Gentleman Never Tells and definitely recommend it. Ms. Gray is a fresh new voice in historical romance and I look forward to seeing what comes next from her. Her writing is engaging and witty, and the prose is rich and intricately layered. In the meantime, A Duke Never Yields is already on my list of books to buy for February! There are subplots involving Roland’s grandfather, a supposed curse on the castle, and mysterious residents who may or may not be real, that I’m anxious to find out the resolution to. Lisa is a law school graduate and aspiring writer working on her first contemporary romance. She first started reading romance back in high school and hasn’t looked back since. Lisa enjoys good friends, good food, good wine, and stories with strong heroines and happy endings. She’s loved The Dish since its debut and is excited to join as a guest blogger! Thanks Mary-sounds like I've done my job! :) Hope you enjoy. Welcome to the team, Lisa! And thanks for the terrific review. I have added this one to my list! Thank you for the lovely welcome Andrea! :) *hugs* Hope you enjoy AGNT and look forward to discussing it with you! Thanks for the review. Sounds great! I always agonize over whether to read in order or not. I hate missing anything but on the other hand books languish in my tbr pile. Great review and this story sounds wonderful!! I think that's a dilemma we're all familiar with catslady, lol. And thank you for the kind words about my review. What a great review, Lisa. You truly whetted my appetite to read "A Gentleman Never Tells." I've heard some really great things about this novel and if it's written by Julianna Gray, it's a definite winner. Thanks Connie! :) I appreciate your kind words. Juliana is a talented new voice in historical romance. Looking forward to what's coming next from her. I love the era the book is set in. Me too Na! Such an exciting time with so many advances and changes happening. I love reading new authors and this sound really good. Hope you enjoy it as much as I do Quilt Lady! I have not read this author before, but her book sounds really great.. I will have to do some more checking into her books.. I have been seeing this book around and I would love to read it.